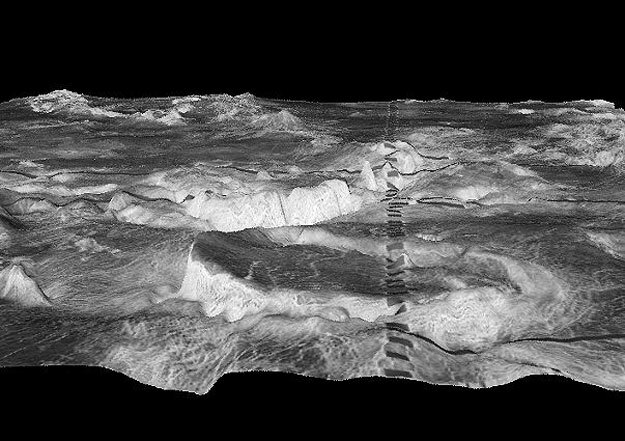 Explanation: What could cause a huge cylindrical mountain to rise from the surface of Venus? Such features that occur on Venus are known as coronas. Pictured above in the foreground is 500-kilometer wide Atete Corona found in a region of Venus known as the Galindo. The image was created by combining multiple radar maps of the region to form a computer-generated three-dimensional perspective. The series of dark rectangles that crosses the image from top to bottom were created by the imaging procedure and are not real. The origin of massive coronas remains a mystery although speculation holds they result from some form of volcanism. Studying Venusian corona help scientists better understand the inner structure of both Venus and Earth.